I got an email a couple weeks ago asking if I'd like to try a new cheese product. "Sure," I said, "I love cheese." And indeed I do. 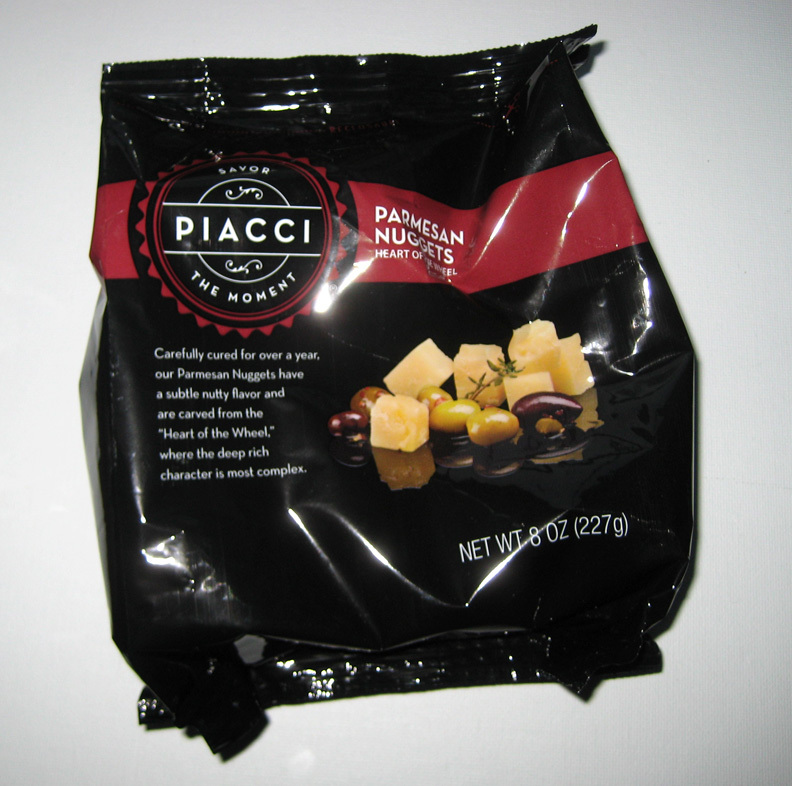 Within a few days, a bag of Piacci cheese had arrived on my doorstep. I had been hoping for some of their Fior-de-Latte, but with the warm weather we'd been having, it was nice that they sent a sturdier cheese along - Parmesan. We always have some parm in the house, either a small slab or some of the pre-shredded stuff that comes in little tubs in the gourmet cheese department of most supermarkets. Mostly it goes on pasta or salads, but here was a new form to play with - nuggets. Actually, perfect little 1" cubes. My first thought was that they'd be fine for snacking out of the bag, but after sampling one, I realized they were perhaps a bit too intense for that. Better to eat them with a selection of antipasti - olives, salami, roasted peppers. Then I realized that little 1" cubes would be a perfect thing to stuff into a meatball. A turkey meatball, flavored with fresh basil and topped with pesto. Ordinarily, I'd use a softer cheese for that, like mozzarella. That makes for a gooey center, but there's also a good chance that the cheese will find a way to migrate out of the ball and into the pan. And I know there's a dirty joke in there but I'm just too tired to think of it right now. I'm sure you'll help me with that. 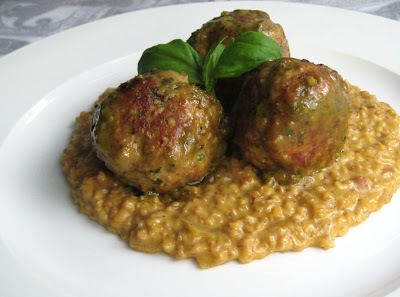 I served the stuffed meatballs with a simple steel-cut oat risotto, a side of asparagus, and some marinated tomatoes. And it was all good. Soak the ground chia seeds in the water for about fifteen minutes until they reach a jelly-like consistency. Place the bloomed seeds in a bowl with the ground turkey, basil, and onion. Mix well to incorporate seeds and herbs. Season with salt and pepper. If the mixture seems too moist, add some dry bread crumbs, a tablespoonful at a time. Divide the meat mixture into 10-12 portions. Form each portion into a ball, poke a hole in the center and add a cheese cube, then use the meat to close the hole over the cheese. The cheese should be completely encased in the meat. Heat a sauté pan over medium heat and add 2 tablespoons of canola oil. Brown meatballs all over, then add stock. Turn heat down to low and cover pan. Braise meatballs for about 30 minutes, turning occasionally, to make sure they are cooked through. Most of the liquid should evaporate during that time. Stir in pesto and heat through.